Does a 35-pound dictionary count as a gadget? I don't know. I don't know. 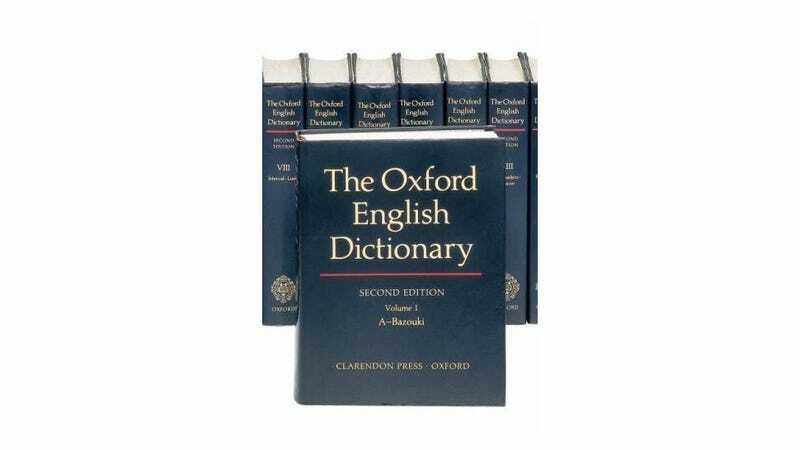 The Oxford English Dictionary is useless. It serves no practical purpose, is devoid of any remnant of meaningful utility, is obsolete, is a 19th century relic compiled over decades during which the whole of the Transcontinental Railroad was built and John Henry dropped dead, replaced by the steam engine, and an iPhone app. And yet, doesn't 22,000 pages of words about words sound fun? The full OED probably won't be printed again. That's a shame, but also an extremely obvious reality. Remember back in 2007 or so, when you got your first iPod Touch or iPhone or whatever the hell? One of the first five things you downloaded was probably a dictionary (if only because dictionaries made up something like 30 percent of all early apps). I think I paid like $8 for Wordbook back then, which at the time represented a week and a half of ramen. Granted, that was more utility than pleasure. But with the books there's just something pleasant about (imagining) sitting down and paging through a whole entire language that seems unbearably twee, but just as unbearably cool to have around.